I have been slowly but surely trying to sort through my stash of broken-things-to-upcycle in the garage lately. I showed you on Monday my Sunshine Nursery Art I made from old baby gates. Well, next on the list was this broken chair from my dining room set. He picked out a small piece of hardwood at Lowe’s for the table top and after removing the seat of the chair he traced the chair top onto it, then cut it out with the circular saw. A few screws secured it to the chair and then he passed it to me for the spray paint treatment. Three coats of Krylon Dual in Gloss white and Minwax spray polyurethane finished it off. This was one of those super easy projects that I kick myself for not doing years ago. 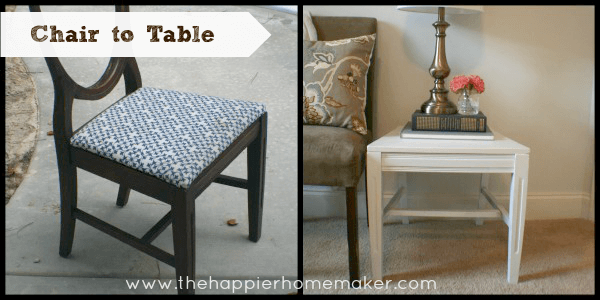 I love the way the lighter paint shows off the detailing on the front of the chair table. I’m sure you could find any number of cool antique chairs on freecycle, in thrift shops, or on craigslist that would be perfect for a repurpose like this. Come back tomorrow to see what in the world I upcycled a broken coat rack into! Linking to Creating With the Stars Week 1 Link Party! Holy cow – that turned out gorgeous! What a great idea!!!! Thanks for sharing! Wow, you would never know it was a chair!! That turned out great, well done! oh i LOVE this!!! love this love this love this. yes the lighter finish definitely brings out the details and it’s such a nice piece now. it’s such a VERY nice piece now! what the what? OMGSH! That is freakin’ AWESOME!!!!!!!!! Did you need to level the chair? I guess antique’s are level, cause none of mine are. I was wondering if you cut or trimmed them? I think I would be painting my table and all the other chairs white like this one…. looks much better white to me. Great job. What a sweet idea! Yet another to-do item!!! So pretty and so creative. And I can’t believe you painted this with spray paint. You must be a spray painting pro! OMG, this looks absolutely amazing. What a wonderful transformation. 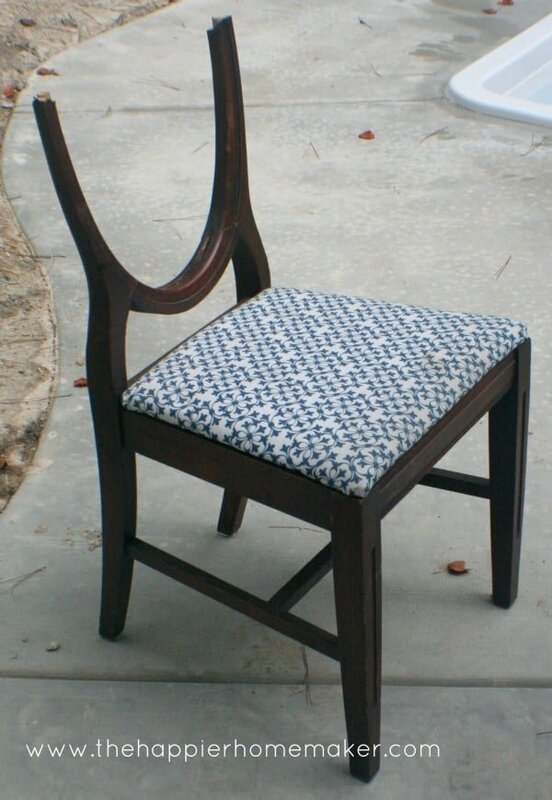 I am not going to look at a broken chair the same way again…….lol Great job! I just saw this at Roadkill Rescue and LOVE it! What a great idea! It seems to be the perfect little cocktail table now. Tell hubby good work! 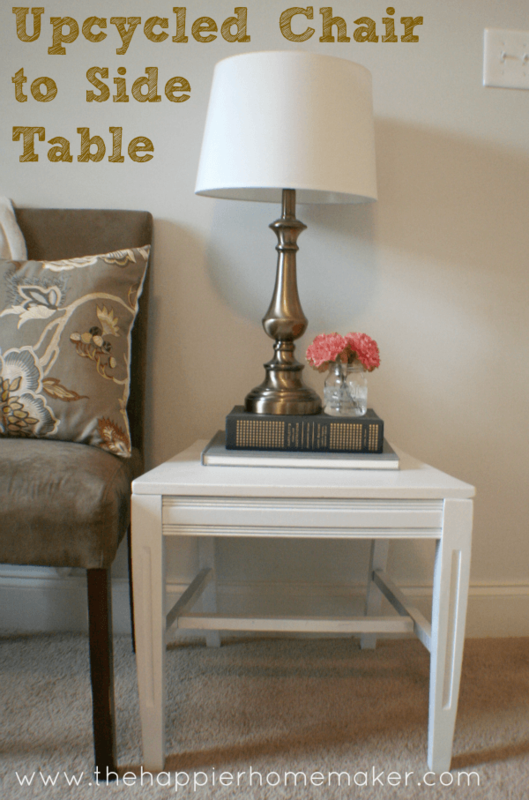 I’ve been looking for ways to build a side table or make over a thrifted one. Thanks to your project, I think I found my solution! Thanks for sharing! What a great idea, I wouldn’t have thought of doing this in a million years! But how did he remove the back of the chair and how did he treat what was left behind? Hi Patricia! My husband cut off the chair back with a circular saw then cut a new top of the chair seat from scrap wood we had. Then we sanded the edges of the cut pieces and spray painted!